I follow Ali on Twitter and at the beginning of the year she mentioned doing a project call "Granny A Day"
I found out this didn't mean you had to be a granny for a day *sniggers* but meant to crochet a Granny Square a day, and eventually by the end of the year you'd have enough squares to make either a very big blanket, or a lap blanket and cushion covers. Infact on my travels around the internet, I found granny squares being used for a multitude of things like jackets, bags, coasters and much more. As I wanted to learn to crochet, I thought this project would be an ideal way to practice tension, holding the hook, as well as learning the different stitches. Like knitting instructions it is a completely different language and lots of abbreviations to learn. I actually started around January 4th. Chose my colours and away I went. I found this video by MikeySSmail on YouTube and it's so easy to follow. 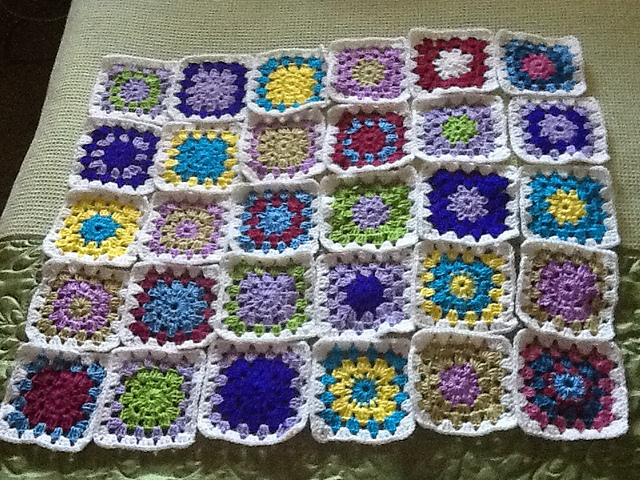 Here are my first 30 squares. 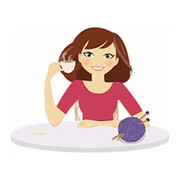 The yarn I am using is a mixture of DK Acrylic, DK wool and Sock Yarn. I have been a subscriber to several Craft magazines and every so often you'll get some free samples of wool. I am also using that. 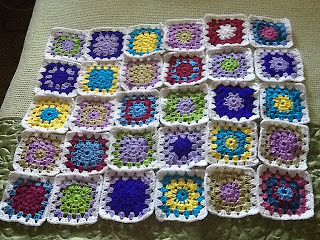 I'm edging every square with a cream coloured DK and once it has reached the size I want I will put a border on it. I'm so pleased with it! !